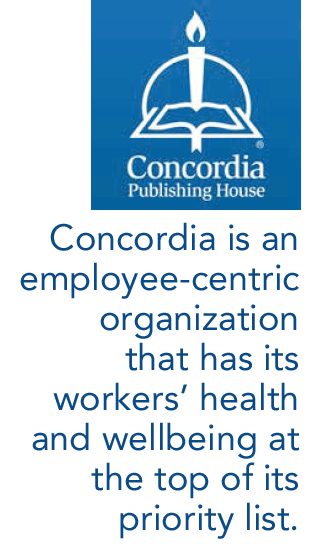 Concordia Publishing House was founded as a small St. Louis printer in order to provide materials for churches and individuals. Today, the company thrives as a nationally recognized publishing company that offers churches, schools, and individuals more than 8,000 products and services. The business currently focuses on printing, warehousing and publication processing. Concordia is an employee-centric organization that has its workers’ health and wellbeing at the top of its priority list. Because of this, Concordia’s leadership decided to call the experts at Blue Line Technology to conduct an evaluation and to perform workplace violence training. Blue Line Technology provides assessment services required to identify potential threats and provides guidance on how to diffuse potentially dangerous situations. With more than 75 years of combined experience in law enforcement, including primary duties that include the training and awareness of workplace violence, Blue Line executives Joe Spiess and Tom Sawyer are a resource that HR executives, business owners and managers have come to appreciate. “We just wanted to make sure that we were doing everything we could to ensure that we provided a safe, secure workplace for our many hard-working employees,” said Dana Neuhaus, Director of Human Resources. Eager to learn how to detect potential problems, the team participated in specific taining and a detailed assessment. After the evaluation and training were complete, leadership came to recognize potential threats that they had not been aware of before. The Blue Line Technology team designed protocol for the company and formulated a deterrent plan complete with the implementation of its facial recognition system, First Line Facial Recognition, at the company’s two primary entrances.The team worked with Concordia Publishing to ensure the proper training and database setup for First Line Facial Recognition. Concordia was implementing a RIF (reduction in force) action when one particular individual threatened to harm members of the leadership team. Proactively the business leaders decided to approve a plan to protect their employees and limit access to known, approved individuals. 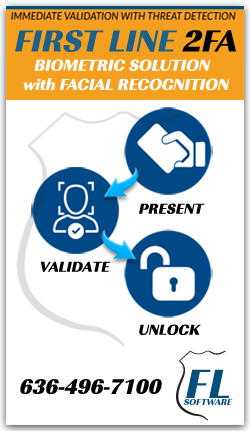 The First Line Facial Recognition software provides a database capability consistent with the size required. In Concordia’s situation, 368 faces were registered as part of the normal HR “on-boarding” process. Cameras were set at two primary access points and after quickly scanning the individual’s face, the system provides one of three defined signals: apprved, unknown or alert. Additionally, First Line Facial Recognition is set to record 5 seconds before and 5 seconds after an event for forensic capability. Most importantly, the alert signals are sent to key managers in the company. The cameras are dedicated for facial recognition functionality via an IP address, and the alert will actuate power control devices for the electronic door locks, stopping an unregistered or unauthorized person from entering the facility or doorway. There is no reason to pause or interact with the device, as required by other biometrics, including the other facial recognition on the market. Adding this layer of enhancement to existing security provides an added benefiting threat prevention.